When you're on an airplane, there are two things that'll make for a much more pleasure flying experience. A few extra inches of legroom and a good pair of headphones. Now, not all of us can afford the luxury of getting out of economy. Sure, some airlines and planes have roomier seats than others, it all depends on what jet and carrier you get, but when you're on a date and budget constrictions, you're not really afforded much choice. However one thing that is in your control, is a pair of noise-canceling headphones. You can pick up a decently-rated pair on Amazon for well under $100 and it'll make flying that much easier for you. Unless the battery in them explodes all over your face, like what happened to this Australian woman as she napped during a flight. 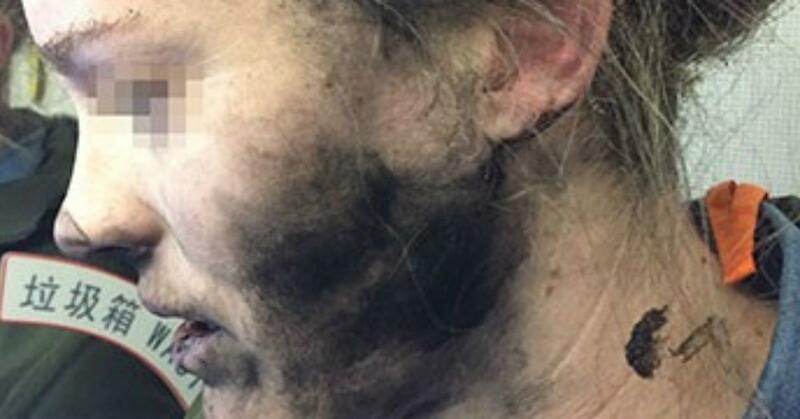 On a trip from Beijing to Melbourne, the woman awoke to a loud explosion and a burning sensation on her face, she said in an official statement with the Australian Transport Safety Bureau. "As I went to turn around I felt burning on my face. I just grabbed my face which caused the headphones to go around my neck.“I continued to feel burning so I grabbed them off and threw them on the floor. They were sparking and had small amounts of fire.“As I went to stamp my foot on them the flight attendants were already there with a bucket of water to pour on them. They put them into the bucket at the rear of the plane," she said. Flight attendants responded immediately by pouring a bucket of water on the headphones. The battery and its cover melted and eventually stuck to the floor of the plane. The residual smoke and smell of the headphones caused passengers to cough and choke during the remainder of the flight. There's no information on the brand of the headphones, but Transport security does believe the batteries in the device are what caught fire. Cue the Samsung jokes.